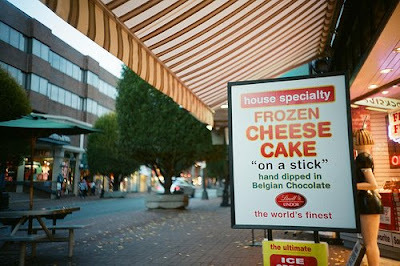 The “Blog” of “Unnecessary” Quotation Marks: "on a stick"
I would really like to see this alleged stick. And not just because I am a big fan of 1) cheese cake 2) stick foods. Thanks, dvb, who saw this in Victoria, BC. Today is my first time reading this blog, I didn't know it existed. If I had of, I could have sent thousands of signs that my old boss posted around our work. Make sure you "check" each box. I just came across you blog. It is making my "day". I live in Victoria and I've seen that sign--how could I miss so obvious a misused quote? Like, "Wow! That cheesecake is on a stick! ", but shortened for the sign when the salesperson heard the consumer's reaction. I will now be on the "look-out" for unnecessary quotation marks. Your blog is hilarious! Is the cheese cake related to Jose Jalapeno?? Pink, you read my thoughts. I can't be sure if it's an endorsement, but when I hear this sign read aloud in my head, it's in José Jalapeño's voice. One day I'll go in and buy a Cheesecake "On a stick". I hope it comes in a cup. Haha! I'm glad I'm not the only one who went right to Jose the Jalapeno..."on a steeeck"! It could be an actual quotation. CMOT Dibbler sold much quasi-edible merchandise "onna stick." this is freaking brilliant. well "done"
Jeff Dunham is where my mind went too. Charley Cheesecake... on a steeek!